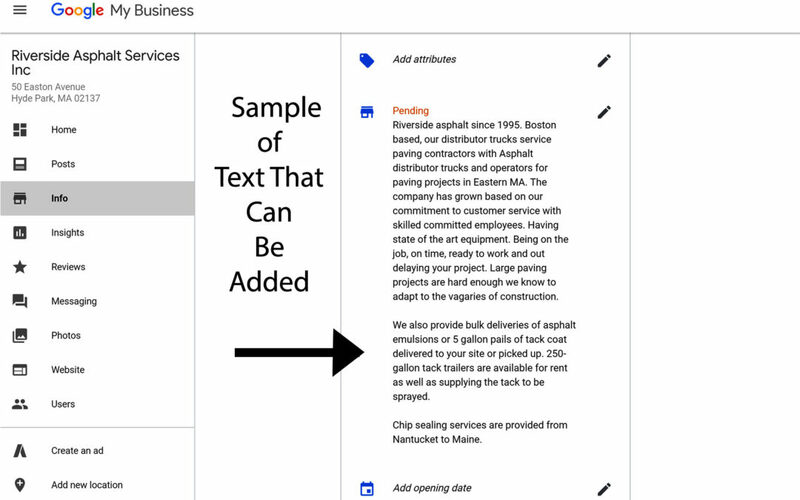 Now you can post a business description right to the knowledge panel. Earlier this month the ability to edit the content in your business listing description has been added back to the Google My Business page listing. This gives you the company owner a chance to present your company information as you want to present it yourself. Since about 2016 this was not available. Now you can describe what you do and describe it the way you want as long as you stay within the guidelines. Before this change, the information that was displayed was populated to the listing by Google. Usually, the description was extracted from website content. Being a new feature the effect is not clear if the increased amount of the information posted to the listing has any effect on how your listing will show up in the search results. It has not been tested by anyone, but it only makes sense that the more information you have on the company presented to the visitor the better. It should increase the chances you have of the visitor going to your site or call to do business with you. As with any other effort to optimize your google my business page the more, you do in comparison to the competition who may ignore there listing the better off you are. After you log in to the Google My Business console there is a new section. Click on the information tab This will show the next screen where there is the field titled “add business description” with a pencil icon next to it. Click on that and it opens a box where you can write out a description that is up to 750 characters. I just happened to write one that comes out to exactly that amount. As of this video, it is pending review. For me, it makes sense to write out the information in a word processor get it to where it reads well then past it into the field. I am going to cover them here and have a link at the end for reference. Here are the things that Google is looking for when entering the description of your business on the Google My Business page. Do not mislead users with false information about your business or the services and products offered.